Whatever your tow truck needs Charterhouse Towing London service can handle it. 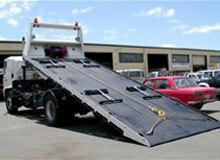 We can tow your vehicle from or to wherever you may need. Visiting your family in Sarnia and the car breaks down but you prefer to have it looked at by your mechanic in London? No problem, give us a call and we will pick you and your car up and tow it to your local auto body shop. We are there when you need a tow truck near you for long distance towing or short distance towing. We have even done towing in Tampa and have done towing service in Casa Grande! WE HAVE EVEN DONE TOWING IN TAMPA!